Unleash your Halloween spirit with this online video slot from Nyx Gaming. 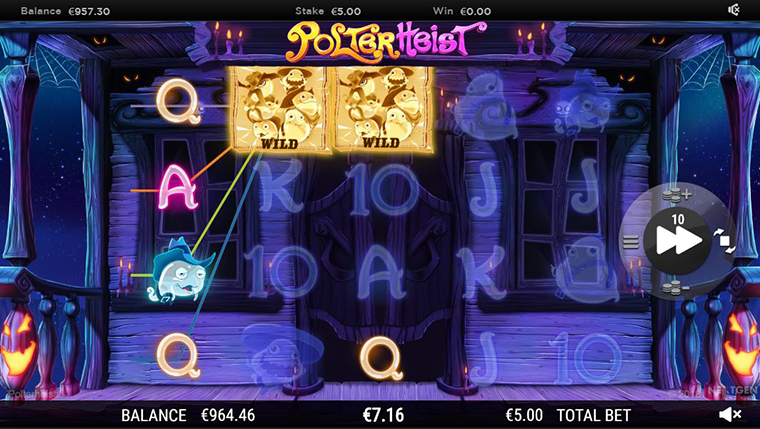 PolterHeist is built on 5 reels, 4 rows structure and has an impressive 100 paylines. The providers have made the game available both on mobile and on desktop, so you can take it with you wherever you might go. The starting bet of €0.50, while the maximum bet is €50. With an RTP of 96.2& and medium-high volatility, we’re expecting some really thrilling gameplay. The Ghost Break-In feature is triggered at random. At the beginning of any spin, one of the 5 ghost symbols can appear and add stacks of the same symbol anywhere on the reels and turn all other ghosts into it. Haunted Wild feature is triggered at random and it consists of 2 to 4 wilds being added to the reels at the beginning of any spin. Wild substitutes for all other symbols except for the Safe and it is present only on reels 2, 3 and 4. Why play it: Scare the living bejeesus out of a posy of ghosts with this online video slot designed by NYX Gaming. Get into the Halloween spirit with the eerie sounds, spooky animations and enjoy the built-in features that will thrill you!